Size: Each print is 4" x 5"
Selling Madonna looks at the history of images of mother and child. Specifically the project looks at representations of mother and child in advertising published in parenting magazines in the year 2005 and looks at similar images from renaissance paintings. Together the set of images presents an iconography of motherhood that is over 500 years old and continues to saturate media images today. 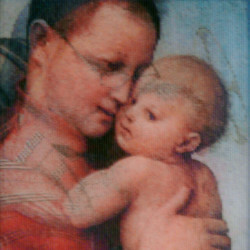 As the viewer walks past the images they morph from images that distinctly read as advertisements to images that reference Christian Renaissance Art of the Madonna and child. The process of morphing creates grotesque images of motherhood that, for me, question reality and the truth of photos and paintings. How many mothers are actually represented by these classic images, or, more importantly, how many mothers or images of parenting are left out? Motherhood is not always romantic, as the classic images might suggest. selling madonna#6 of 8. Animation reflects how lenticular lens works. selling madonna#3 of 8. Animation reflects how lenticular lens works.